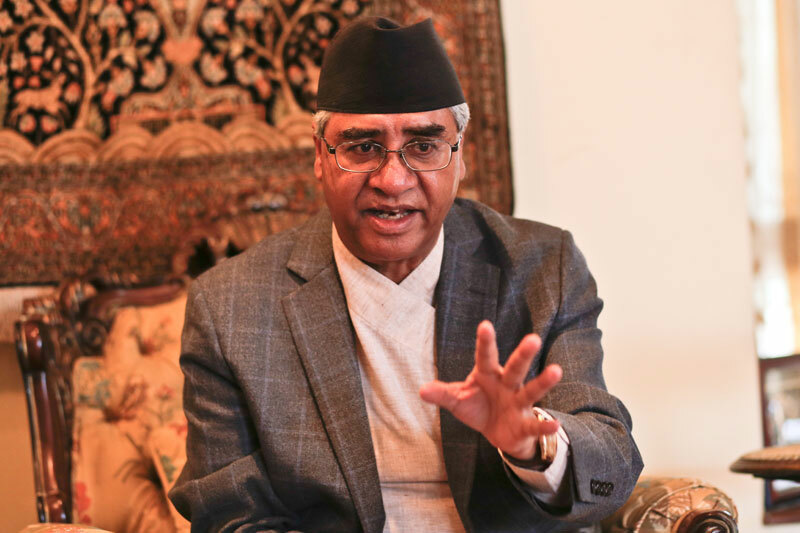 KATHMANDU, Oct 10: Prime Minister Sher Bahadur Deuba has expedited talks with other political parties to secure a comfortable majority in parliament for his government, as coalition partner CPN (Maoist Center) has forged an electoral alliance with the main opposition party CPN-UML. According to senior leaders in the ruling alliance, Prime Minister Deuba is thinking of relieving the Maoist Center ministers in his cabinet of their responsibilities. “It is likely that the Maoist ministers will themselves step down from their posts on moral grounds. Prime Minister Deuba is mulling to relieve them of their responsibilities in case they do not step down voluntarily and induct ministers from the other parties in the ruling coalition,” said one party leader familiar with developments. Deuba has entrusted Bimalendra Nidhi and Minendra Rijal with the negotiations with other parties in the Nepali Congress (NC)-led alliance to bring them on board the government. On Monday, Kamal Thapa’s RPP informed Speaker Onsari Gharti Magar that they have decided to extend support to the NC-led government. Taking to twitter, RPP Chair Thapa said it was natural and the need of circumstances to forge an alliance with NC after Maoist Center decided to be part of the UML-led alliance“ “It is natural and the need of circumstances for RPP to cooperate with democratic forces and the Nepali Congress following the electoral alliance between UML and the Maoists,” said Thapa. RPP Joint Spokesperson Mohan Shrestha said Prime Minister Deuba has asked their party to join the government. “Not much has been discussed about it. We have not had any discussion about sharing ministerial portfolios,” he said. Sources said there is an understanding that NC would support RPP in seven electoral constituencies in the parliamentary polls and in 32 constituencies in provincial polls. NC leader Nidhi and RPP leader Buddhi Man Tamang have already reached a written agreement to this effect, according to NC sources. At least 297 votes are required to secure a majority in parliament. With RPP officially extending support to the government on Monday, Prime Minister Deuba is looking for the support of the Upendra Yadav-led Federal Socialist Forum Nepal also so that he can garner 302 votes in his favor even without the support of various fringe parties. Although the Yadav-led FSFN has extended support to the government, the party is less likely to join the government, according to party insiders. The party has assured Deuba that it would help his government survive in case the Maoist Center pulls its support to the government. “It is up to Prime Minister Deuba now to decide whether or not to reshuffle the government. Since any reshuffle is likely to affect the upcoming elections, it is good to go into elections with the existing cabinet,” said a senior leader of the party that supports the ruling alliance. The Election Commission (EC) says Prime Minister Deuba cannot remove ministers from his cabinet unless the concerned parties give their consent. “The transitional provisions have clearly stated this. So, the ministers can be removed and the cabinet reshuffled only when the concerned parties agrees to this,” said EC Commissioner Narendra Dahal. The EC has already conveyed this message to the prime minister. The election code of conduct is already in force for the provincial and federal elections. Although Article 77(2b) clearly states that a minister shall cease to hold office if the prime minister removes him/her from the post, transitional provisions stipulated in Article 298 of the Constitution make it mandatory to secure the consent of the party concerned to relieve a minister from that party. Ministers and state ministers shall be relieved of their positions only “if the Prime Minister relieves him/her of the office at the recommendation or with the consent of the respective political party,” according to Article 298 (9c).